Home Drugs and Pharmacy What Does Cocaine Taste Like? What Does Cocaine Taste Like? Cocaine is a stimulant that has the potential to lead to disastrous legal, social and bodily consequences. Cocaine may lead to a wide variety of health problems, including stroke and heart attacks. When mixed with alcohol, it produces a chemical compound called cocaethylene, which drastically increased the risk of immediate death by cardiac complications. As people may be concerned about being exposed to cocaine, it is reasonable to try to determine what cocaine tastes like. It is important to note that cocaine is not consumed orally, but used either intravenously or by inhalation through the nose. The plant which cocaine is derived from the coca plant. The natural leaf may be used in teas and as a chewing leaf. This leads to effects similar to caffeine. However, when chemically treated and processed, the psychoactive compounds may be concentrated into cocaine. This plant, however, has been used safely for thousands of years before the active chemical compound was isolated by Albert Niemann in 1859. Cocaine is not used orally, as the effects are much more noticeable when the substance is used intravenously or inhaled through the nose. Movies and television shows often depict people tasting cocaine. The purpose of this is not to become high, but rather to determine if the cocaine is real. Cocaine will have a numbing effect on the gums. However, it should be noted that this would not be common practice as it could result in death if the cocaine was mixed with arsenic or other deadly chemicals. The most common way to use cocaine is my inhalation through the nose. This is what is most commonly depicted in movies. This leads to a longer duration and less intense effects. Cocaine may also be injected. This is less commonly seen in films, as injections normally signify the use of heroin. Injection of cocaine leads to shorter duration and more intense effects. Crack is made from cocaine may be smoked by using a glass pipe and injected intravenously. It is vaporized and then inhaled through the mouth or mixed with an acidic solvent and then injected. This is commonly used by people who are poor. 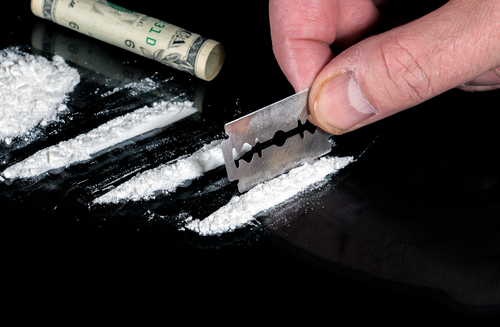 Cocaine may have a variety of tastes. There are numerous ways that cocaine is cut with other substances. Cutting means adding in other chemicals to add bulk for distribution and higher sales. Talc, the most common chemical which is added to cocaine, tastes like baby powder. Cocaine may taste salty, sour or sweet. As cocaine is cut before it is distributed, as pure cocaine may kill those who use it and would be financially unreasonable to sell, there is no set taste. However, the taste of cocaine is not the other way to tell whether or not the substance in cocaine. Cocaine has a texture that is similar to powdered sugar. Cocaine that is crystallized or floury has been cut with unusual substances. This is common as the cocaine will be cut multiple times throughout the distribution process. Most dealers will cut and recook the cocaine before they sell it again. As discussed before, the reason why people taste cocaine is to test the numbing effects of cocaine. Movies may depict people tasting cocaine, but that is not what is actually done. They place the cocaine on their gums, where they are attempting to determine if it numbs the gums. The reason why they are shown drawing their tongue along their teeth is to see if the gums themselves are numb. However, it should be noted that this is unrealistic. Drug dealers would not risk the potential death by placing the untested substances in their mouth. Cocaine also has a smell that can be described as a mixture of burnt plastic and gasoline. This is due to the chemicals that are used during its manufacturing. However, the smell is normally only noticeable when the drug is close to the nose or when it is being consumed. Because of this, you will likely already be in a risky environment when you notice the smell. However, if you are choosing to consume cocaine and you realize that it has a different odor, then you may realize that you are using a different substance. To be clear, if you find yourself in a situation when you are attempting to determine if you are tasting cocaine, then you should remove yourself from that situation as soon as you are able. There are many negative effects of cocaine. Cocaine is one of the most addictive substances that can be consumed, and it may lead to bankruptcy, social repercussions, and imprisonment. Cocaine sales are closely monitored by the DEA and other law enforcement agencies. Cocaine is highly addictive and has the potential to lead to death. It should be avoided and not sought out. Those who use cocaine are often dangerous and potentially armed. They are likely to be aggressive and may become aggravated if you determine that you no longer want to purchase and consume cocaine. Cocaine use may also lead to the us of even more deadly and dangerous drugs. People who are addicted to the effects of cocaine may choose to use methamphetamine when there is no cocaine available. It is best to leave any situation or person who seeks to involve you with cocaine. Keep in mind that your health, social reputation and legal status are all at risk when you decide to use cocaine.